The Chief Executive Officer of the Ghana Cocoa Board, Joseph Boahen Aidoo, has revealed that the new administration has saved the country some Ghc80 million, following the review of a fertilizer and chemical supplies contract of over GHC500 million, awarded by the John Mahama administration shortly before they left office, after losing the 2016 election. Mr. Boahen Aidoo, who spoke to journalists at a news conference on Wednesday, took on the NDC Minority, because according to him, they have made several baseless and false claims about the new government’s management of the cocoa sector. He said the free fertilizer programme for instance, was used by the NDC to introduce sub-standard and inefficacious fertilizers into the cocoa Hi-Tech programme. According to him, the NPP Government has now re-introduced the fertilizer subsidy programme with quality and high yielding fertilizers. Mr. Boahen Aidoo further revealed that, the NDC administration spearheaded procurement of agrochemical and fertilizer inputs above allocated budgets, and that the budgets for the years were exceeded through padded contracts. 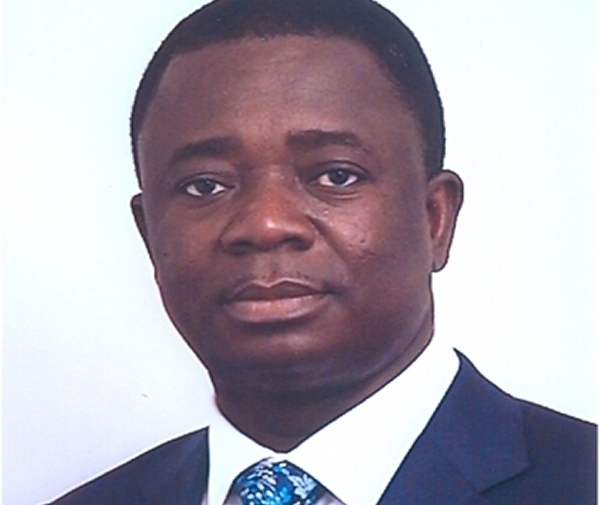 Dr. Stephen Opuni, former Cocobod boss. “In addition to this, the NDC Government had awarded contracts for fertilizer and chemical supplies worth more than GHC500.00 million before leaving office in January 2017. The new management had to renegotiate these contracts, saving the Ghanaian farmer over GHS80.00 million” he noted. According to Mr. Boahen Aidoo, the penchant to siphon funds through inflated contracts was rampant in the NDC administration through ill-conceived construction contracts in the cocoa sector. He said such contracts were awarded without proper value for money analysis, bringing into question the motive behind them. He named one of such wasteful contracts as the building of an “unnecessary COCOBOD Guest House” in the Northern Regional town of Bole, where then President Mahama hails from. Joseph Boahen Aidoo accused former President John Mahama of influencing the construction of that guest house for his personal comfort while in office. Mr. Boahen Aidoo insisted that the erstwhile administration of COCOBOD led by Mr. Stephen Opuni, rather misappropriated millions of cocoa funds on frivolous activities. He revealed that the Economic and Organized Crime Office (EOCO) is investigating possible cases of financial malfeasance during the tenure of the former COCOBOD CEO, Dr. Stephen Opuni. The Stabilization Fund policy was introduced by the NPP administration led by President Kuffour in the 2004/2005 cocoa season to support farmers from the effects of international price volatility. The Fund had accumulated an amount of GHS206.50 million when the NPP Government took over in January 2017. The budgeted figure of GHS93.5 million for the 2016/2017 season was not set aside by the NDC Government as a result of misplaced priorities. After the NPP administration took over in January 2017, an amount of GHS103.5 million has been added to the fund bringing the cumulative balance to GHS310 million. The actual amount required to maintain the producer price in the 2017/2018 season is GHS1.294 billion. The price subsidy to farmers is, therefore, GHS984 million after setting off the stabilisation fund of GHS 310 million available. It is worth noting that this reckless commitment above the budgeted amount was questioned by the Public Procurement Authority (PPA) in December 2016 when COCOBOD needed to seek approval to award additional contracts and the Authority inquired about the availability of budgetary provision to enable it to approve the requested contract awards. The NDC Government at the time justified the road contracts in a response to the PPA. This was the time when the NDC had woefully lost the elections and was trying to acquire retrospective approvals for the contracts already awarded without initial approval. Ladies and gentlemen, I am sure we are all aware of the legal implications of this action taken by the NDC administration. It later turned out that the justification of all the awarded road contracts as having budgetary provision was a palpable lie communicated to the PPA in order to have the contracts receive approval. COCOBOD budgeted to achieve a production tonnage of 900,000 metric tonnes of cocoa in 2014/2015. Crop forecast and COCOBOD Research analysis had indicated a realistic production of 750,000 metric tonnes. The COCOBOD Research forecast was rejected by the then Chief Executive, Dr. Stephen Kwabena Opuni, who was an appointee of NDC. The free fertilizer programme was used by the NDC to introduce sub-standard and inefficacious fertilizers into the cocoa Hi-Tech programme. Cocoa farmers expressed misgivings and disquiet in accepting the sub-standard fertilizers through the free fertilizer programme introduced by Dr Opuni and the NDC regime. He resolved to wilfully cause financial waste such that farmers would be compelled to accept the fertilizers for free if acceptance through the subsidized sale was not successful. The NDC administration spearheaded procurement of agrochemical and fertilizer inputs above allocated budgets. The budgets for the years were exceeded through padded contracts. Worse to mention is the fact that these agro inputs were rushed through the scientific testing regime by the Cocoa Research Institute of Ghana (CRIG). Officials of CRIG who resisted to rush the products through the fast-tracked testing regime were transferred. These inputs were confirmed by farmers across the country to be ineffective and it is not surprising that Ghana’s cocoa production plummeted to the 740,000 and 778,000 tonnes in the 2014/2015 and the 2015/2016 seasons respectively when Dr Opuni was in charge of COCOBOD. For example, the contract for COCOBOD to construct a guest house at Bole in the Northern Region was needless at the time it was awarded. President Mahama was said to have influenced the award to enable him to enjoy comfortable holidays during visits to his constituency. Also, the contract to construct a 50,000 metric tonne warehouse at Tema was not considered to be financially and operationally prudent at the time since COCOBOD already had enough warehousing capacity at Tema to sustain its operations into the foreseeable future. The warehouse rehabilitation contract at Abuakwa in Kumasi was not required at the time since the facilities were in excellent working condition. Last but not the least, a whopping US$24 million contract was awarded to demolish excellent staff housing quarters in Tema, only to construct new housing facilities raising several questions about the motive for the award of the contract. It is still surprising how the full drawdown of US$400.00 million (GH¢1.69 billion) was fully expended between 20th December 2016 and 6th January 2017 when the NPP government took over after 7th January 2017. Audit findings into the utilization of the amount will be made known to Ghanaians at the appropriate time when the full facts are unravelled. Despite this inability to account properly for the loan, the NPP Government was saddled with a whopping debt of GHC19.6 billion after taking over in January 2017. It is worth noting that the extent of mismanagement left by the President Mahama administration with Dr Opuni in charge of COCOBOD needs experienced and prudent management to redeem the institution from its current debts and mess. Thus, on assumption of office, the NPP administration has initiated various value for money audits, and Ghanaians will soon know the extent of rot left by the President Mahama administration at COCOBOD. Staff are either on leave, at the post or interdicted and payment to them are not considered wasteful. The President Mahama/Opuni tenure used export duty payments from COCOBOD as a conduit to syphon funds for activities not related to cocoa. A case in point is the payment of US$25million from COCOBOD to Construction Pioneers (CP) in January 2016 to settle judgement debt awarded against the Government of Ghana in the UK. Without this payment, Government was to lose a property worth about US$1.2 million in the UK as a result of reckless handling of debts owed CP. This amount was taken from COCOBOD in the name of “exercise” duty (in the word of the then Deputy Minister of Finance – a Board member of COCOBOD Casiel Ato Forson). The payment under export duty was to make it appear legitimate.